Box Turtles are best known as the turtles that can draw their head and legs into their shell and close it down in a box like protective manner. They are also the most land based of all the water based turtles in the family Emydidae. Depending on the source, North America hosts either two native box turtle species, the Eastern Box Turtle (Terrapene carolina) and the Western Box Turtle (Terrapene ornata) along with their subspecies, or four separate species, Florida Box Turtle, Woodland Box Turtle, Ornate Box Turtle, Three-toed Box Turtle. Eastern Box Turtles (Terrapene carolina carolina) exhibits the widest range, extending from Southern New England, south to the Florida state line and west into Indiana, southern Illinois, Kentucky and Tennessee. 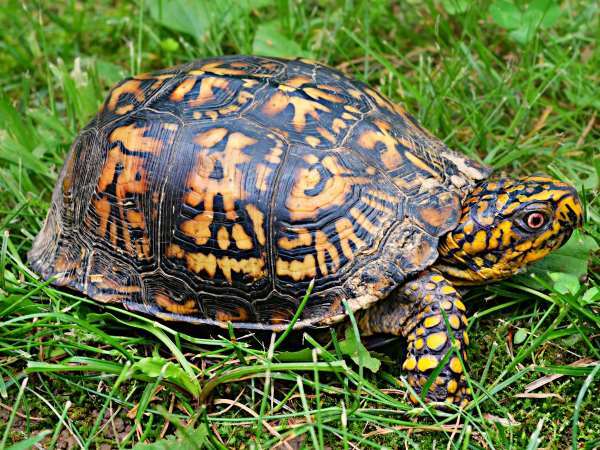 The Three-Toed Box Turtles (Terrapene carolina triunguis) ranges through the South Central United States. 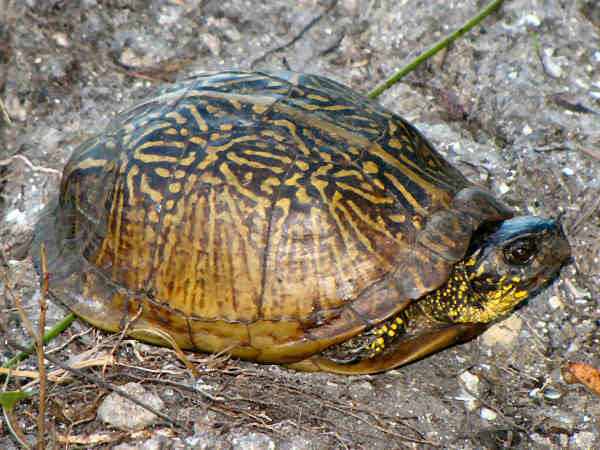 The range of the Florida Box Turtle (Terrapene carolina bauri) is limited to the peninsula area. Several state regulatory agencies in the Northeast (Connecticut, New Hampshire, New Jersey, New York, Massachusetts, and Pennsylvania) and Midwest (Ohio, Indiana, and Michigan) United States have listed it as a species of “Special Concern.” It is also considered “Protected” in Rhode Island, and “Endangered” in Maine. Habitat destruction is commonly cited as a primary factory affecting populations. Whether or not altered habitats contribute to disease and increased mortality in turtles is still a big question. The presence of ranavirus and its deleterious effect on local box turtle populations, however, is not in question. According to the article, PCR Prevalence of Ranavirus in Free-Ranging Eastern Box Turtles (Terrapene carolina carolina) at Rehabilitation Centers in Three Southeastern US States, the issue is important because of the havoc an outbreak can cause for already stressed populations. Ranaviruses (genus Ranavirus)have been observed in disease epidemics and mass mortality events in free-ranging amphibian, turtle, and tortoise populations worldwide. Infection is highly fatal in turtles, and the potential impact on endangered populations could be devastating. In their normal forest habitat they are usually very easy to identify as the high domed turtles walking around. They do have different shell patterns and coloration depending on geography and range. 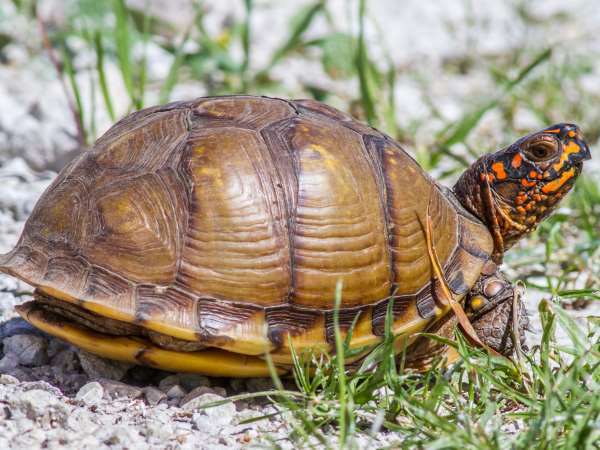 For example, the first box turtle picture shows a Florida Box Turtle. The Second picture shows an Eastern Box Turtle. Some eastern box turtles have brown shells. Others, like the one in the picture have yellow markings on the shells and on the feet and face. Three-toed box turtles get characterized as the western most species or subspecies of the Eastern Box turtles. Their range kinda extends to areas adjacent to the Mississippi river from Illinois to almost the Gulf Coast. The Gulf Coast Box Turtle range is immediately along the coastal areas. The name says is all, many, but not all of the species have only three toes on the back foot. The picture also shows there is not much physically different in the species from the other two species. There are colorful patterns on the face and arms.. Sometimes there are no patterns on the shell. Western Box Turtles have different physical and behavioral characteristics than Eastern Box Turtles. Behaviorally their habitat is mostly grasslands and desert areas rather than the forests. Their shells have a bit less pronounced dome. Two subspecies of the Western Box Turtle (Terrapene ornata), also known as the Ornate Box turtle, inhabit dry and sandy habitats in their range. The more common subspecies, the Ornate Box Turtle (Terrapene ornata ornata), inhabits the grasslands of the central United States from South Dakota, south through Texas. 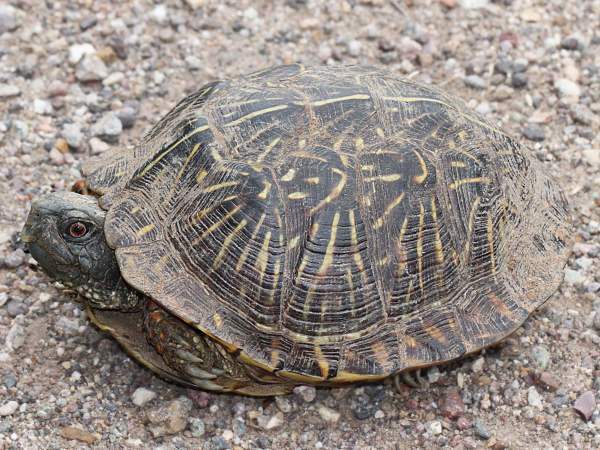 The Desert Box Turtle inhabits the grassland areas of the Desert Southwest regions, south to northern Mexico.